Every time the Bureau of Economic Analysis releases a new set of GDP data, it is almost a taste of Christmas for us national accounts nerds. Today, the BEA published second-quarter GDP data for the several states. And an interesting set of data it is. We need to take a look at it, because what is superficially some really good news will be used by some legislators - and, I fear, Governor Mead - to motivate both more government spending and higher taxes. 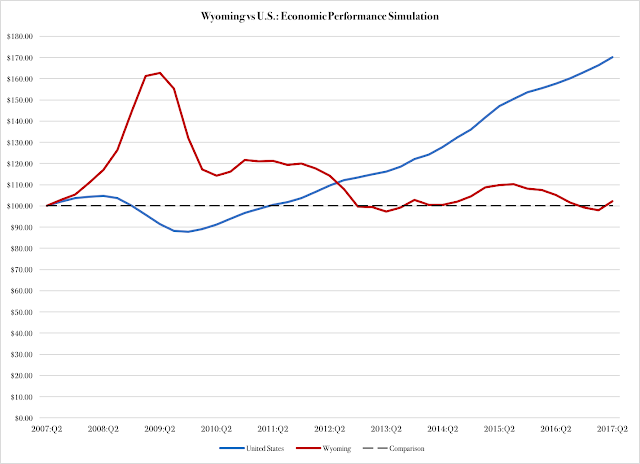 As a pre-emption, let us therefore start with the aggregate second-quarter state GDP number for Wyoming: a significant 3.2-percent increase over the same quarter last year (adjusted for inflation) looks pretty good, especially in comparison to the national GDP growth rate of 2.0 percent. 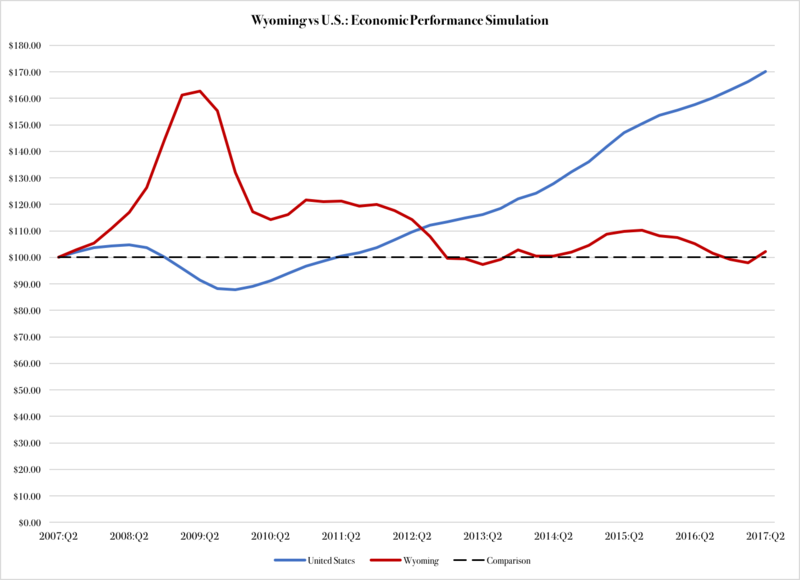 Private-sector economic activity in Wyoming increased by 4.2 percent, compared to 2.2 percent nationally. Right here, I can hear the palms sweating on assorted tax-hungry legislators. We are out-growing the rest of the country; the depression is over; the decline has come to an end. The heydays of endless tax revenue will soon be back again. Arts, entertainment and recreation represents 0.7 percent of our state's economy. Its increase, which is really an expression of volatility, is therefore of no consequence whatsoever for the Wyoming economy. Of much more importance is the increase in minerals activity. Let us get back to that one in a moment; first, a word on real estate, rental and leasing. With its 11.4 percent of GDP, this industry is the second largest in the private sector here in Wyoming. Its growth record has not exactly been stellar: in the past two years, from Q2 2015 to Q2 2017, it has only expanded a total of 4.6 percent. However, if we back the tape just one quarter, to Q1 2015, that growth rate shrinks to 1.3 percent. In other words, our second-largest private industry has been standing still for a couple of years. Its growth spurt in Q2 of this year is neither anomalous nor promising of future dividends to come. In fairness, it does suggest that our state's economy has stabilized. I am worried, though, what the proposal to raise state property taxes will do to real estate, rental and leasing companies here in Wyoming. Add a tax on services to that, plus a future Gross Receipts Tax, and things do not look all that good for this industry. Manufacturing also showed a nice little spike in activity. It is entirely attributable to a 6.2-percent rise in the production of non-durable goods. Since this industry is about half as big a share of our state GDP as real estate (5.4 percent) this increase has moderate impact on our overall growth. That said, a rise in any private sector is welcome; in this case, the multiplier effects are fairly strong, since goods need trucks, warehouses and other logistics to get from the producer to the buyer. There is not to be jubilant about in this industry, which adds some six percent to the Wyoming GDP. Total production of logistics services is 5.6 percent below where it was two years ago, adjusted for inflation. With no trend upward, at least our logistics companies can take solace in the fact that their markets seem to hold steady in a new, less prosperous normal. Among the industries with negative growth, it is troubling to see such a plunge in construction. The annual value of construction activities - which account for 4.3 percent of state GDP - was $1.56 billion, the lowest it has been in at least ten years (again adjusted for inflation). -On the other hand, when we break down these numbers, it turns out that this is not a jump in the "core" minerals sectors. Since coal is still trending downward, employment-wise, compared to last year, and since jobs in oil and gas extraction are basically flat, it would seem as though rare-earth minerals extraction is the only mining activity that has seen any growth. On the upside, support functions have done well compared to last year. On the downside, the strong jobs increase, by more than 25 percent, we saw from late last year to the first quarter this year, has tapered off. 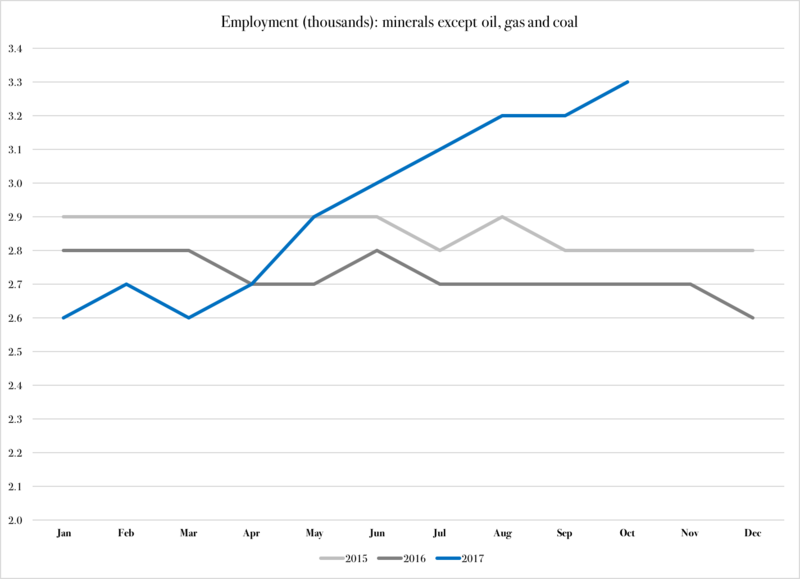 Since June, this segment of the minerals industry has maintained a stead 8,200 employees. Furthermore, since about 1,500 of those jobs have gone toward supporting oil and gas activities, and there has been no increase in extraction-based employment, there is no reason to interpret this as anything other than yet another contribution to our new, less prosperous normal. Lastly, we all know that these GDP numbers - or the shallow end of them - will be used next week to motivate all kinds of government spending (Governor Mead's budget is on its way) and the pursuit of new revenue (the tax hikers on Revenue Committee are finally going to have to come out of the closet). Therefore, let me put this little spike in GDP here in Wyoming in perspective. Suppose that, ten years ago, you had put $100 into each of two bank accounts. One account paid interest according to the annual growth rate (reported quarterly) of the U.S. economy; the other account paid a similar interest based on the performance of the Wyoming economy. If anyone believes that higher taxes will help us catch up with the nation's economy as a whole, then I have a bridge to sell you in Brooklyn. In fact, I'll throw in the river underneath it for free. The bottom line is that we are in a new macroeconomic normal, that we will remain here for the foreseeable future - and that higher taxes and other missteps by government will put us back on the downslope again. With that, I am taking a Thanksgiving break from blogging. Back on Monday the 27th. We all need to recharge our batteries for the political battles that await us: the coming three months are going to be hectic, and entirely decisive of what direction our state is going to take: prosperity or welfare statism. Until then, enjoy the gravy!